Jeremy Corbyn’s speech on Brexit has opened up, finally, a clear distinction between Conservative and Labour policies on Brexit. The UK government is committed to an independent trade policy after Brexit, Labour is now committed to a comprehensive customs union with the EU. Beyond that much of Labour’s deliberate ambiguity of the last year and more remains: Labour wants all the benefits of the EU’s single market but without being in it and with exemptions from some of the rules. Those who think this speech shifts Labour towards the possibility of supporting ‘remain’ and a further EU referendum are indulging in wishful-thinking. What sort of customs union? Corbyn’s speech was short on detail. Labour would aim to agree a ‘new comprehensive UK-EU customs union to ensure that there are no tariffs with Europe and to help avoid any need for a hard border in Northern Ireland’. But Corbyn did not spell out how comprehensive – does that include agriculture and fisheries is one crucial question (the former vital for Northern Ireland). And he also insisted that the UK would have a say in EU trade policy and ‘would not countenance’ being a rule-taker. This is entering ‘cake and eat it’ territory. Turkey, the major example of an EU customs union with a non-member state, has a joint committee with the EU that discusses customs union issues. It gives Turkey some voice but no vote or real influence on EU trade policies. In a customs union, the UK would, by definition, be a rule-taker, obliged to implement the same external tariffs to third countries as the EU. Nor would the UK get the direct benefits of all existing EU trade deals with over 60 countries round the world. It would have to apply the tariffs set in those deals and then attempt to negotiate access in separate deals to those markets (as Turkey does). If the UK wants a real say in EU trade policy, it would have, simply, to stay in the EU. But crucially Corbyn’s speech is clear enough to give Labour MPs a mandate to vote for an amendment to the trade bill to support a customs union. There is, though, a crunch question as to whether there is a majority in the House of Commons for a customs union – Labour Brexit rebels could counter votes of pro-customs union Tories. And since Corbyn’s strategy is clearly to try to provoke a general election, how many Tory rebels would there be? But if Theresa May did lose a vote on a customs union, it would impose a different negotiating strategy on the government than the painfully stitched together one she will announce this Friday (that EU president Tusk has already called an illusion). This would leave the current Brexit shambles in further major disarray. But it would need a vote of no confidence to provoke an election. There was no hint in Corbyn’s speech that Labour would support a further EU referendum on the deal, so Labour would go into any general election simply on the basis of its customs union policy on Brexit with continuing vague promises on the single market. This raises serious questions for the SNP in planning for any early general election scenario as they could well end up holding the balance of power. Would the SNP come off the fence on supporting a further EU referendum or make its support conditional on a second independence referendum? Corbyn insisted that all EU powers in devolved areas should go to ‘the relevant devolved body’ so there will be Labour and SNP agreement on that. One interesting further twist is that if there was a Labour government which negotiated a UK-EU customs union this would impact on the implications of an independent Scotland choosing between being in the EU and the European Economic Area. In the EEA/Norway model, Scotland would be outside the customs union which would mean a border between Scotland and the rest of the UK. In the EU, Scotland would be in the customs union, and single market, and also have a vote on EU trade policy unlike the UK. Corbyn repeated the claims that he and Keir Starmer have made for the last year that the UK could maintain full access to European markets and maintain the benefits of the single market while going ahead with Brexit. Yet Corbyn said that free movement of people would end and Labour would have a fair and reasonable migration policy. 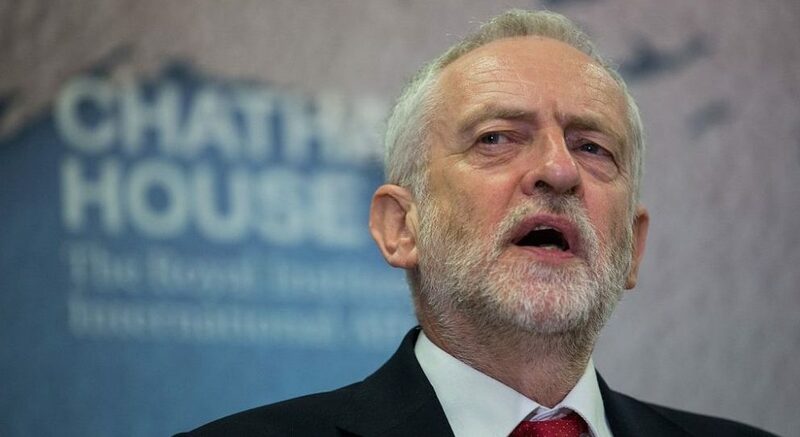 Corbyn’s concerns that the EU or EEA would restrict his desired economic and industrial policies were also on full display as he insisted he would ‘negotiate protections, clarifications or exemptions where necessary’ for privatisation, public service competition and more. So this is a ‘cake and eat it’ approach to the EU’s single market too. Labour would not follow the EU’s four freedoms including free movement of people, would want a range of opt-outs on single market rules and still want full access. The EU has insisted repeatedly that such an approach is not on – Norway and Switzerland follow free movement and the EU is not about to undermine the integrity of the single market or the EEA. And even if Corbyn’s ‘cake and eat it’ single market approach were possible, it would also mean the UK was a rule-taker there too – implementing EU rules with no vote and little voice. A customs union approach would limit some of the damage from Brexit but it is a partial approach indeed. Services trade needs full membership of the EU single market if it is not to be very hard hit by Brexit (estimates of up to 60% falls in EU-UK services trade are serious). And manufactures will still face border challenges – not least showing they are conforming with EU regulations and rules – that will get in the way of just-in-time, cross-border production. A customs union helps but doesn’t solve the Northern Ireland/Ireland border for similar reasons. Corbyn mentioned tariff-barriers a lot, but non-tariff barriers (the crucial impediment to trade flows) not at all. Corbyn’s speech is most important for its opening up a clear policy divide – 20 months after the Brexit vote – between Labour and Tories. That should make for an opposition starting to hold the government more to account. Whether it will result in the torpedoing of May’s Brexit strategy or even in an early election are the big questions that lie ahead. The headline does not quite do justice to the speech which is centred on ‘the cake and eat it’ strategy. Sad but not surprising that Corbyn does not recognise the dangers to working people of being outside the Single Market. Despite numerous visits to Brussels one wonders when U.K. politicians will grasp that the EU is not going to accept cherry picking. TPTB will now agitate for Mayhem to be unseated and as an excuse to call an early GE, the kitchen sink will be thrown to boost corbyn”s election prospects, and EUrope and the NWO in tandem with the UK televisual media: will do their bit. It nearly worked for corbyn last GE, the UK establishment will be hoping to up the ante and return corbyn as titular leader of the UK Leninist party. oh and btw, if Britain is turned into Venezuela on Thames so much the better. “coz they deserve it said soros, the tory patricians; major, hezza, the supreme court, and handelscrote, mrs guyana, branson, bliar the pope and probably the Chinese too.